Photo of the plaque, published in the Spanish daily, Público. On the Norwegian island of Utoya, scene of that horrific massacre of young members of the Labor Party by a right-wing Christian terrorist, there is a plaque, tacked on to a tree, honoring the four Norwegian members of the International Brigades who were killed in the Spanish Civil War. 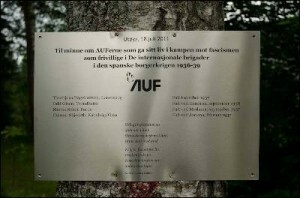 Apparently, the young campers had organized a tribute to the volunteers on July 18 –the 75th anniversary of the beginning of the war– and prepared the plaque for that occasion.